Game mats can be uploaded as a jpg or png, and each has a face image and a back image. All image files must have a resolution of 300 PPI/DPI, and all dimensions are in pixels. Game mat images must be sized exactly or the system will not accept the image files for use. There are sixteen sizes of game mats available. 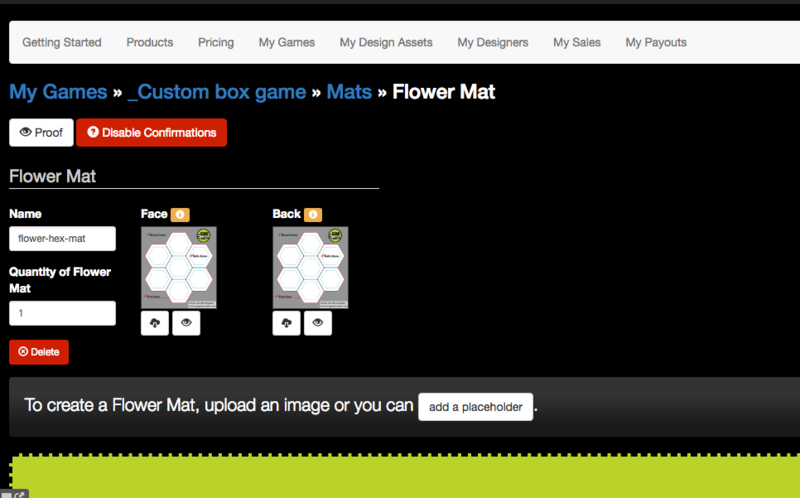 Next, click on the green Edit button for the type of Mat you want to add. There are 16 types available. Then, click or drop the file for your mat face image onto the yellow rectangle on the screen. A mat will be created, using this image for both the face and the back. If you wish to upload a different image for the back, simply click on the "Back" image, and you'll be able to select a new file for the back of your mat. Congrats, you've successfully added a game mat to your game! You can repeat this process to add different mats, or you can update the quantity if you need multiples of the same mats.